About – These are basic steps for downloading video from the Panasonic AC90 and creating a new project Adobe Premiere Pro CC. This is for the video section of COMM 240, Introduction to Multimedia course, at St. Cloud State University, with Jannet Walsh, instructor. Media storage – Acceptable locations only: The DataHD on the lab computers. There is plenty of room for large media files. The other is a portable external hard drive, connect computers with USB or Firewire. It’s just like the DataHD, but you own it and files are not public. Having your own portable hard drive is highly recommend. Jump drive or flash drive is designed only for file transfer and temporary storage. They are not fast enough or designed for editing video. If your jump drive is large enough, you might be able to transfer your project on it when you are done working on it for the day. Create Folder in Data HD in iMac, portable hard drive – In the Data HardDrive or your portable hard drive, NOT jump or flip drive, create a folder for your video. Give folder your name, such as JannetWalshVideoProject. Name it something that will be easy to find. Removal of SD card from iMac – Before removing card, make sure you can locate all your files in your folder in the DataHD or personal hard drive. Right click on the SD card and eject or use the ejection button on the keyboard to remove the SD card. More than one SD Card – If you have more than one SD card to download, create another folder inside video folder, JannetWalshVideoProject, and copy the next Private folders, but don’t rename PRIVATE folder. Follow this procedure for the next SD card download. This will help prevent damaging video files during downloads. Open Adobe Premiere Pro application, icon is purple with letters PR. 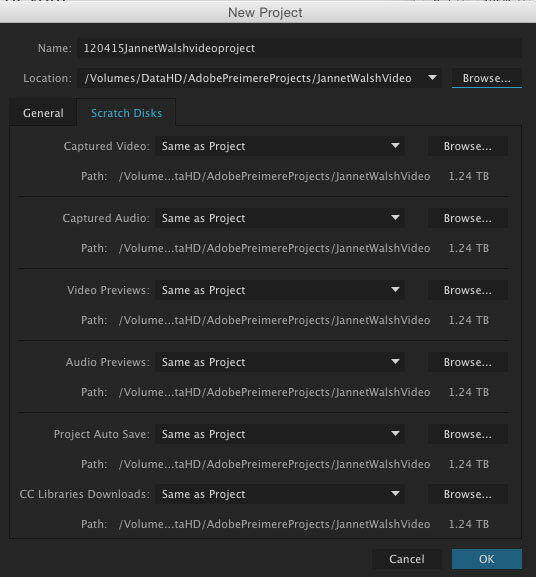 Save project in your video folder, JannetWalshVideoProject, you just created in the DataHD or your portable hard drive. 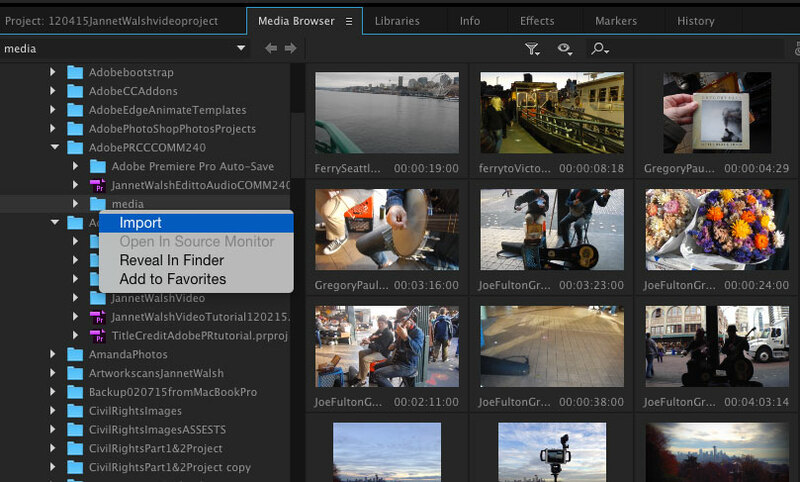 Your clips are now in your media browser ready to edit! Posted in Adobe, TechnologyTagged New project Premiere Pro, Panasonic AC90, Premiere, Premiere Pro, VideoBookmark the permalink.